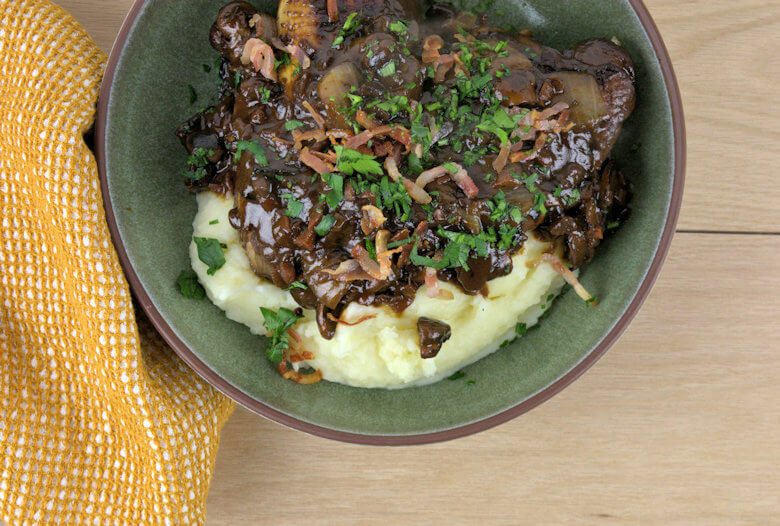 Coq au Vin can be prepared in an elaborate way, but this Simply and Quick Coq au Vin also yields lovely moist chicken meat and a hearty, caramelized red wine sauce with onion and mushrooms. 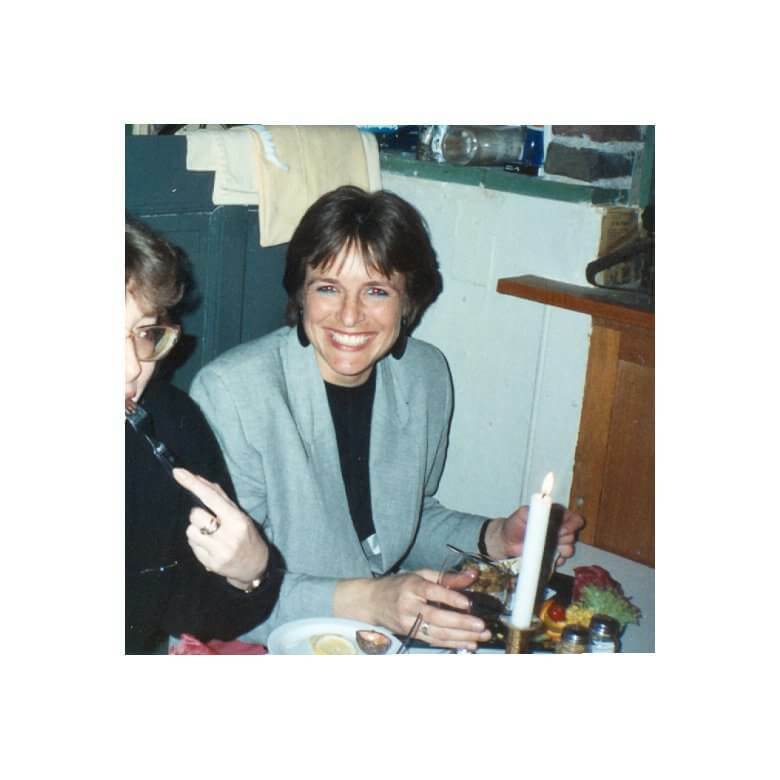 A worthy alternative for your next dinner, may that be Thanksgiving or a family get together. Traditionally, Coq au Vin is prepared in an over and takes a long time to prepare. 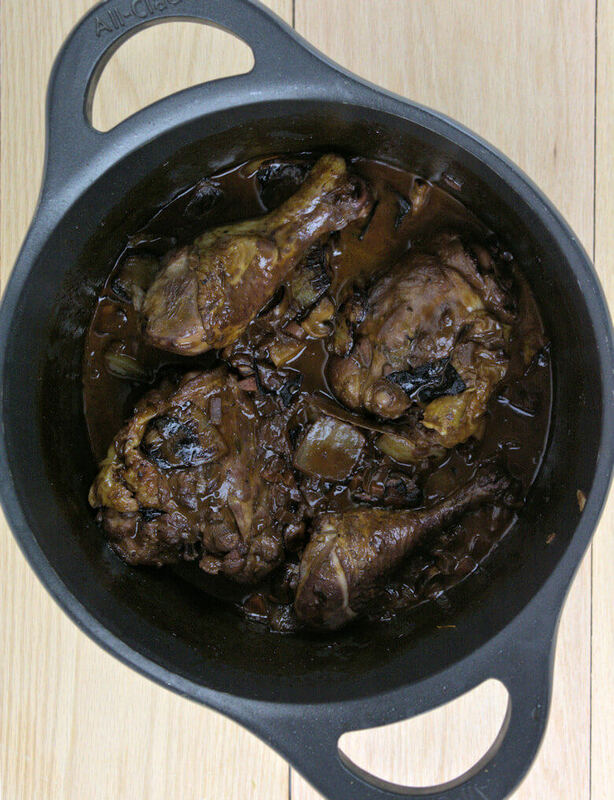 This Simple and Quick Coq au Vin not so much. It is still some work, about 1 hours and 15 minutes to 1.5 hours., but a whole lot less than the French did traditionally. My recipe also yields an extremely rich sauce and juicy chicken. The mirepoix (onion, carrot, celery) in combination with the chicken is cooked in the red wine and chicken stock and the flavor at the end is rich, creamy with a hint of caramel. It is not difficult to make; you need a little bit of time for getting the right flavor, but not too much to prepare. Cut the bacon in strips and cook it in a Dutch oven over medium heat until crisp. I used a combination of applewood smoked bacon and pancetta. A combination of smoky flavor and garlicy/herbal pancetta. Once crispy, drain on a kitchen towel. This is the garnish at the very end. The flavorful grease is the basis for the rest of the recipe. Cook the chicken brown in the recipe on all sides and remove. Add onion, celery, carrots, and bay leaves and cook until soft and fragrant. Add tomato paste and red wine and cook until reduced to half. This takes about 10-15 minutes. Return chicken to the pan, and add chicken stock. Bring to a simmer and cook for approx. 45 minutes or until chicken is done. Turn chicken about half way into the simmer time.Remove chicken from pan and keep warm. Make sure the chicken is done. The very first time I prepared this, I totally underestimated the cooking time of the chicken and that night we were eating very late. Heat oil in a skillet and cook mushrooms and chunky onions until golden and translucent. Remove from heat. At the same time, boil the red wine sauce until reduced by half, add mushrooms and onions and return chicken. Simmer an additional 5 minutes until everything is heated. 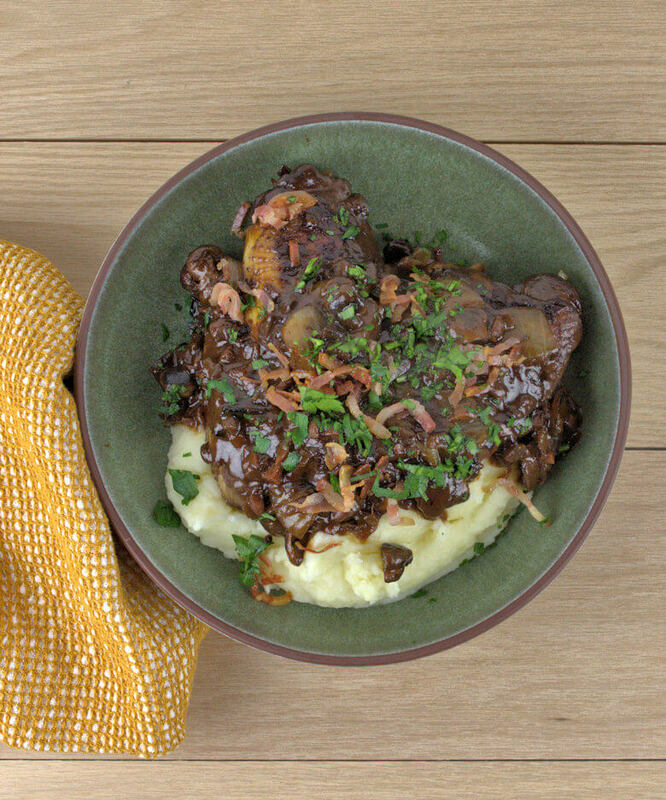 Serve this Simple and Quick Coq au Vin and sprinkle with parsley and the bacon and pancetta strips. This rich dish fills your kitchen with great aroma and it will fill your stomach too. I love to serve this with a creamy mashed potatoes. Creamy potatoes match the hearty chicken and red wine sauce very well. Cut the bacon and the pancetta in strips and cook the in a Dutch oven over medium heat until crisp. Remove bacon and pancetta from the pan and allow to drain on a kitchen towel. Rub chicken with salt and pepper and add to the bacon grease. Cook until all sides are brown. Remove chicken. Add onion, celery, carrots, and bay leaves and cook until soft and fragrant. Add tomato paste and cook until mixed. Add wine and cook until reduced to half, approx. 10 minutes. Return chicken to the pan, and add chicken stock. Bring to a simmer and cook for approx. 45 minutes or until chicken is done. Turn chicken about half way into the simmer time. Remove chicken from pan and keep warm. Heat the oil in a skillet and cook mushrooms and chunky onions until golden and translucent. Remove from heat. Heat the red wine sauce until reduced by half, add mushrooms and onions and return chicken. Simmer an additional 5 minutes until everything is heated. Serve and sprinkle with parsley and the bacon and pancetta strips. I love Coq au Vin, and that thick sauce looks very tasty!